Airsoft vs paintball: both are combat simulation games that use replica guns. In both cases the target is to eliminate opponents by hitting them. Even airsoft and paintball seems very much similar on the surface. Actually there are many differences between them. The equipments including the guns, accessories and gear used are different, the game play rules are different. Do paintballs hurt more than airsoft? Is paintball more popular than airsoft? Airsoft is a competitive team shooting game where participants shoot opponents using spherical plastic projectiles launched via replica air weapons called airsoft guns. Paintball is a game where players compete in groups or independently, to remove competitors by hitting them with capsules comprising water soluble dye along with gelatin shell (paintballs) generated by an apparatus called a paintball marker. Definitely the gun is the main equipment. 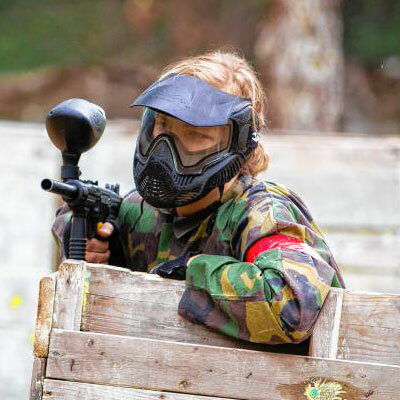 Paintball uses a large hopper to load the ammunition, whereas airsoft uses magazines, just like in real guns, which is very easy to reload and carry. You just need to switch magazines. In paintball the hopper is a bit bulky and when you run out of paintballs, you will need to pour more paintballs in the hopper which is a little time consuming. People who usually switch from paintball to airsoft only because of cost. The gears and guns are much less expensive than paintball and it costs less to play. The maintenance costs are much lower for airsoft guns. For spring or battery powered airsoft guns there is not much extra expenditure in the future. Spring guns are cocked manually and batteries are rechargeable. Paintball guns use CO2. Hence you continuously need to purchase CO2 gas. Though this is true if you buy CO2 powered airsoft guns. Also ammunition for airsoft is much cheaper. It costs around $40 for 2000 rounds of paintballs. But only around $10 for 5000 high quality Elite Force 0.20g airsoft BBs. If you do the math, you can see 1 paintball is 11 times more expensive than 1 airsoft BB. One quick benefit of airsoft ammunition (apart from reduced price ) is its small in size and fit into the standard sized magazines nicely. At a normal M16 fashion magazine you are able to fit as much as 450 rounds! Paintballs are bigger, and hence require huge hopper and unique equipment to take additional ammo into the battle field. One advantage of paintball is if you strike an opponent you’ve got evidence since the paintballs indicate their goals with vibrant paint whenever they strike. So far as game dynamics proceed, the principal distinction is the simple fact that airsoft is based quite heavily on the honour system. As it isn’t always feasible to see whether you hit on your opponent, other gamers need to be fair to your game to function and for everybody to have fun. In paintball, this isn’t a problem because paintballs indicate their goals when they’re hit. Actual guns are designed to work within the business of struggle at an actual firefight that the rifle is actually your life-line. Since airsoft guns are modeled following real-steel firearms, they’re also designed to be more maneuverable and simple to use. In a single line airsoft guns are able to shoot farther and more accurate than Paintball. Airsoft gun can hit a target in a longer range because of its higher FPS and lower BB weight. A paintball travels at approximately 300fps and weighs about 3.2gram. Meanwhile an Airsoft BB can weight anywhere from .12g into .3g, so obviously they’ll shoot further. In terms of accuracy, they are both roughly the same as you’ve got a bore paired barrel except that Airsoft depends more on dialing in hop-up whereas paintball just has a couple of barrels which have that advantage. Aairsoft BBs travel a bit faster than paintballs but paintballs are substantially larger than BBs, resulting is harder impacts. So in terms of simple impacts, a paintball would hurt more in comparison to an airsoft BB. An airsoft participant must use goggles to shield his eyes from harm when playing. A paintball participant must put on face mask when playing to prevent severe harm. Airsoft is cheaper and provides a more realistic weapon and warfare experience however paintball is more popular and organized and has larger events. Overall, both the sports can be a great deal of fun and can be a fantastic challenge. Considering that the games are alike in many ways, personal taste will play a significant role. If you are having difficulty deciding which game you enjoy better, you can try them both!